Anthony Rocca, who served as Development Coach at the Holden Centre between 2010 and 2017, was a favourite of the Magpie Army during his 220 game career in Black and White. He remains at the club in a part-time capacity, as the club's ruck coach and match-day bench coach. He grew up in Reservoir in Melbourne's northern suburbs - Collingwood heartland - and was drafted to Sydney ahead of the 1995 season. He played 22 games for the Swans and was an emergency for the 1996 Grand Final. He requested a trade to Collingwood where he joined his older brother Saverio in 1997. Rocca became the focal point in Collingwood's forward line for a decade, assuming the mantle of the number one man in attack when Saverio was delisted at the end of 2000. He was runner up in the 1999 Copeland Trophy, often playing at centre half back, and was one of the best afield in the 2002 Grand Final with four goals. After 50-goal seasons in 2006 and 2007, Rocca was struck down by injury in his later years. He returned to make some cameo appearances in 2009, when he retired on his own terms at the end of the season. The long forward opted not to join Saverio in trying out as a punter in American Football and instead moved into a part-time role at the Magpies working closely with the VFL side and in particular its key forwards, where he coached alongside Gavin Brown, Paul Licuria, Luke Beveridge, Tarkyn Lockyer and Craig McRae. At the end of 2011, Rocca was promoted to the role of full time defensive development coach, working under McRae. In the years that followed, Rocca worked with the club's key position players at both ends of the ground, overseeing the development of the likes of Brodie Grundy and Darcy Moore. Playing Career: Sydney 1995-1996 (22 games, 11 goals), Collingwood 1997-2009 (220 games, 404 goals). Total games 242, Total goals 415. Honours: 2nd Best and Fairest (1999), leading goalkicker (2000, 2002 (equal with Chris Tarrant), 2006, 2007), vice-captain (2001-2006). 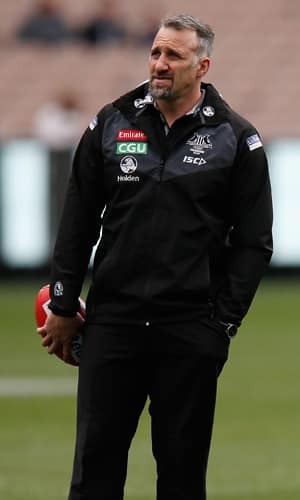 Coaching Career: Collingwood (part-time VFL forward line assistant 2010-2011; defensive development coach 2012; forward line development coach 2013-2017; ruck coach and match day bench coach 2018).